Plans for the new School of Engineering building have been given the green light by Birmingham City Council. The new School of Engineering building, which is intended to open in 2020, will provide state-of-the-art facilities focussed on digital systems in partnership with the rail industry. Specific areas it is planned to centre on include ‘railway control and simulation, data integration and cybersecurity, condition monitoring and sensing, and improved methods for technology introduction’. Funding for the building has been provided by the UK Railway Research and Innovation Network (UKRRIN), a newly created body ‘designed to create powerful collaboration between academia and industry’. UKRRIN is developing three new ‘Centres of Excellence’ of which one, Digital Systems, is being led entirely by the University of Birmingham. The green light from the city council came on May 24th. Professor Mark Sterling, Head of the School of Engineering was ‘delighted’ at the news and called it "A really exciting project that will bring many of our engineering disciplines into one purpose-designed building." A really exciting project that will bring many of our engineering disciplines into one purpose-designed building. 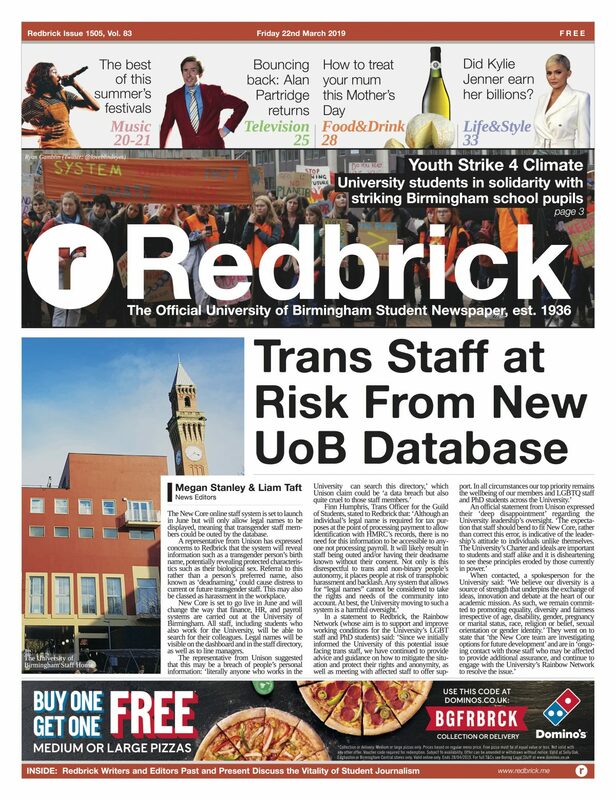 Third year Civil Engineering student Alex Hawkins told Redbrick ‘it's definitely needed as the current building is not fit for modern day practical sessions. It's a shame I won't get to see it as an undergraduate’. He added that he would look forward to visiting it in the future and said the ‘general mood is that it's a great thing, just too late for my year group’. Building on the project is due to commence in August 2018 on the site of the newly-demolished Chemistry West. Professor Clive Roberts, who is the leading figure in the University’s work on digital rail, said that ‘the UKRRIN Digital Systems Innovation Centre will bring industry into the heart of the University campus and ensure that the University plays a part in taking the next step in Britain’s transport infrastructure’.